One of the cells responsible for sending the retinal image to the brain, labeled with a fluorescent dye and imaged with Rochester's adaptive optics technology. The imaging system being developed at Rochester builds on work pioneered by Williams, widely regarded as one of the world’s leading experts on human vision. 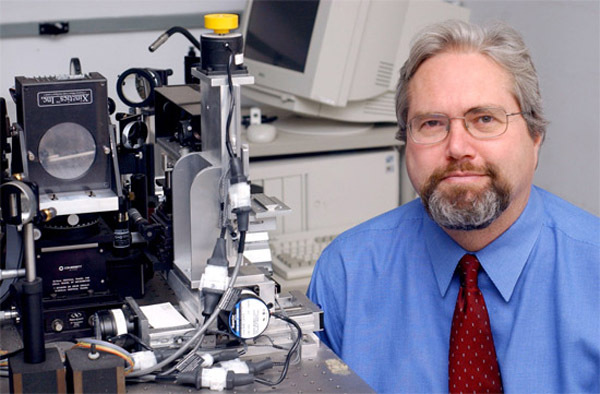 He pioneered the use of adaptive optics technologies for vision applications. David Williams, the William G. Allyn Professor of Medical Optics, dean for research and director of the Center for Visual Science. Adaptive optics was first developed by astronomers so that telescopes could see more clearly through the Earth’s atmosphere. The technologies that Williams and his group developed apply these techniques to the eye and make it possible to image individual retinal cells, down to individual cone photoreceptors in the living human retina, by looking through the pupil. The Rochester team plans to test their system in collaboration with investigators who are exploring three different approaches to vision restoration: preserving photoreceptors with gene therapy, replacing lost photoreceptors using stem cells, and genetically re-engineering cells other than photoreceptors to respond to light. Williams is particularly excited by this. “A single imaging platform will be used to improve three different methods to restore vision,” he added. 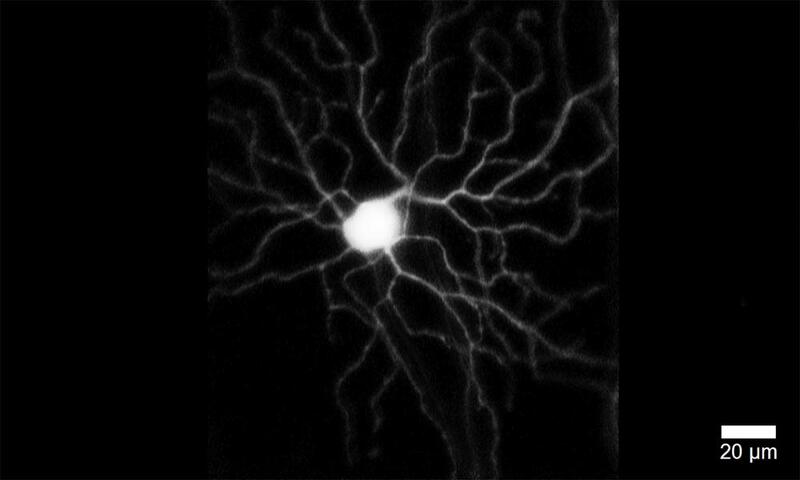 The imaging system being developed by the Rochester team uses two main components: a fluorescent marker that can detect the responses of single retinal cells to light, and two-photon microscopy, which uses infrared light to detect the fluorescent signals without damaging living tissue. The use of two-photon microscopy for imaging the living retina was pioneered by Jennifer Hunter, assistant professor of ophthalmology at Rochester. Hunter is joining up with Williams and Bill Merigan, professor of ophthalmology and an internationally-renowned expert in the circuitry of the retina, to lead the Rochester group. All three project leaders collaborate as part of the work of the Center for Visual Science, which brings together engineering and optics with expertise in ophthalmology. Merigan and Hunter both have primary appointments at the University of Rochester Medical Center’s Flaum Eye Institute. Williams’ primary appointment is in the Institute of Optics, part of the Hajim School of Engineering and Applied Sciences. NEI has committed $17.9 million over the next five years to this initiative, with $3.8 million going to the Rochester team and their partners. NEI will fund four additional projects, three of which are also based on the technology innovated in Rochester and involve collaborators or former postdoctoral fellows from Williams’ group.